The first buttercream frosting I ever made was an Oreo buttercream. Armed with a mini food processor I chopped the Oreos down to mere crumbs and whipped them into Martha Stewart’s vanilla buttercream recipe. After one taste (and a second and third and fourth) I knew I would never buy store-bought frosting again. Well, unless it’s rainbow chip as I have yet to find a good substitute. This Oreo buttercream had my head spinning and it wasn’t just the sugar rush. Something this smooth, decadent and bursting with Oreo flavor only takes a matter of mere minutes and a few simple ingredients? That was a dangerous fact to stumble upon. I have since made many buttercreams, whipped frostings, cream cheese frostings and glazes, but I always find myself coming back to that original Oreo buttercream. When I was visiting my family last summer for our annual beach week I wanted to bring them the best of the best. 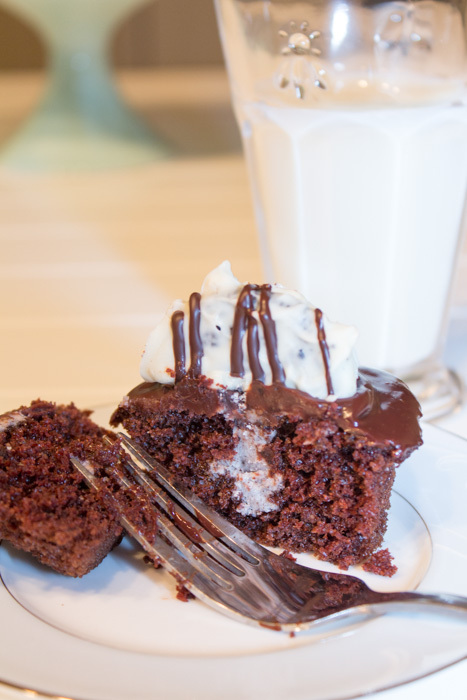 So I decided to combine all my favorites, including these perfect chocolate cupcakes, this amazing chocolate ganache and the above mentioned Oreo buttercream, into an ultimate super cupcake. 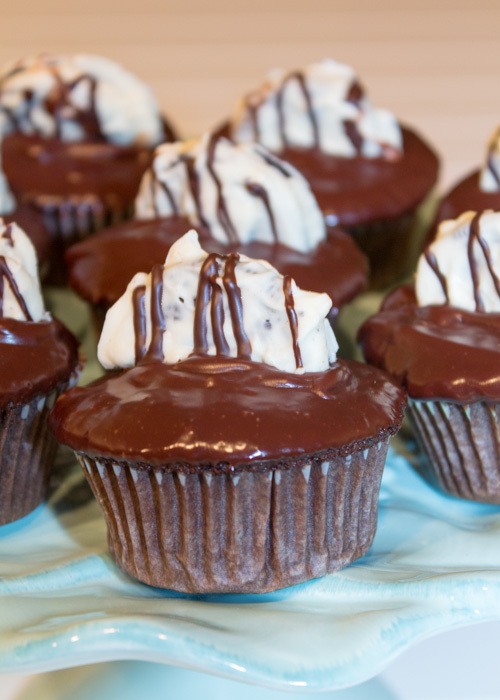 Topped, of course, with a chocolate-covered Oreo, these cupcakes are guaranteed to make your family, friends, coworkers and strangers want to hug you. Or imprison you in their kitchen so you can forever make them these cupcakes, it could really go either way. So enjoy these treats, but proceed with caution. Chop the Oreo cookies in a food processor until they are fine crumbs, or crush in a thick plastic baggie with a heavy object. Whip the butter for 2-3 minutes, or until smooth, with an electric mixer. On low speed carefully add the sugar, milk and vanilla and mix until fluffy. If the frosting looks too thin slowly add some more powdered sugar. Add the Oreo crumbs and mix until well combined. Fit a pastry bag with the Wilton Bismarck tip #230. Fill the pastry bag with the filling. Insert the tip halfway into the center of the cupcake and squeeze in some filling. Slowly start pulling out the tip while still squeezing. Remove and stop squeezing in some filling when the top of the cupcake starts to bulge and is just about to crack. Place in the fridge to chill. Cover a plate or cutting board that will fit in your fridge with wax paper and set aside. Melt the white chocolate chips over a double boiler over medium-low heat. When completely melted stir in the vegetable oil then remove from the heat. 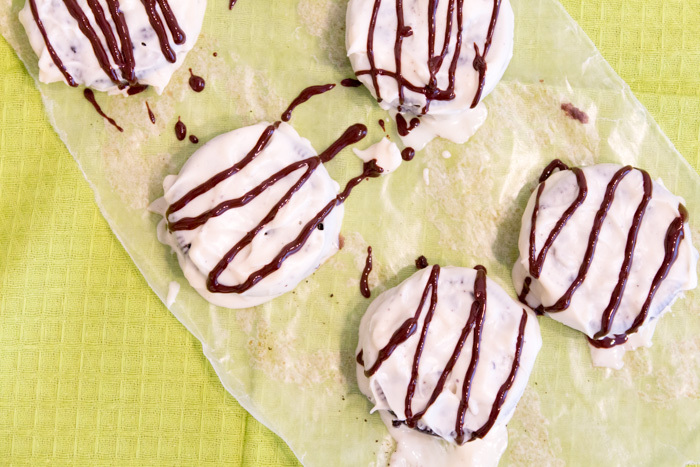 Carefully submerge an Oreo so that it's completely coated in white chocolate before resting it on the wax paper. I used a spoon and a fork to complete this task. Repeat for the rest of the Oreos. Place the Oreos in the fridge until the chocolate has set. When the chocolate is almost set melt the semi-sweet chocolate chips using the double boiler. Set aside to cool slightly. Remove the Oreos from the fridge and place near your workstation. Pour the melted semi-sweet chocolate into a pastry bag fitting with a skinny round tip or a plastic baggie with a very small corner snipped off. Pour zigzag lines over the Oreos then return to the fridge to set. Once the Oreos have set carefully cut in half with a sharp knife. Once the cupcakes have been filled and chilled it's time to top them with the chocolate ganache. If the ganache isn't already warm carefully heat it in a double boiler or in the microwave on low heat. 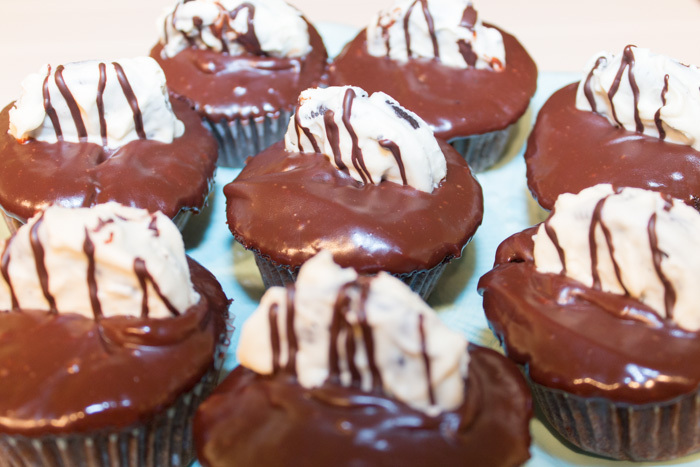 Carefully dip the top of each cupcake in the warm chocolate ganache, letting the excess drip off. After dipping the cupcakes carefully press a chocolate-covered Oreo half into the center of each cupcake before the ganache has time to completely harden. You may have to slightly insert the Oreo into the cupcake so that it stays upright. Return to the fridge to let the chocolate ganache set. Serve chilled or at room temperature. Oreo buttercream slightly adapted from Martha Stewart. I’ve been really into soups lately. Not that I previously disliked soups, they just weren’t in my weekly routine mostly due to the fact that I always end up burning my tongue. Probably the same reason I don’t like hot coffee and let my hot chocolate come to almost room temperature so I can gulp it down, tongue intact. I guess I could also just try being patient, but that’s not really my thing when it comes to food. Lately though, I’ve been putting aside my fears of burnt tongues and really digging soups. It all started with this cauliflower soup. The next week I made a broccoli version and the week after I made it with roast mushrooms. By the fourth week Matt and I decided I needed to expand my soup-making horizons. 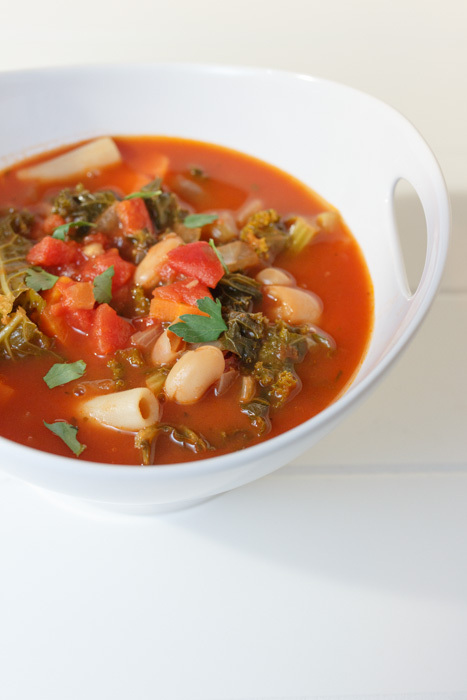 Enter this weeknight minestrone soup. Yum. 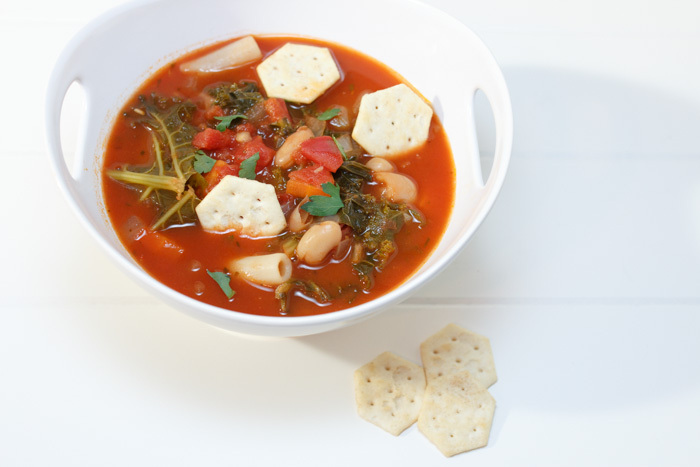 Now this soup was so quick to make that I had serious doubts about the level of deliciousness that it would reach. 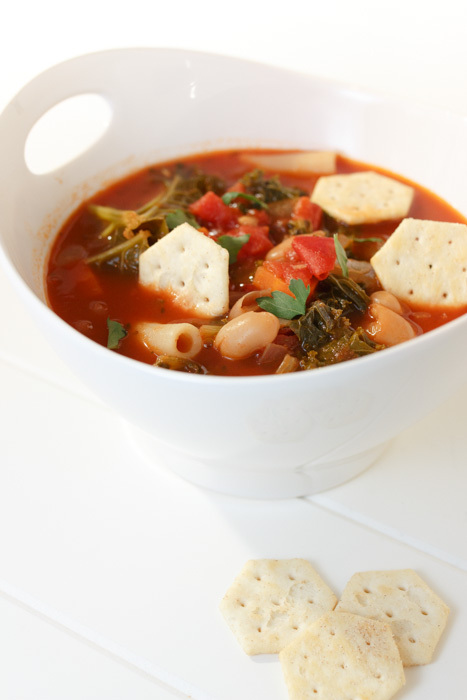 Doubts be damned, this soup is tasty! 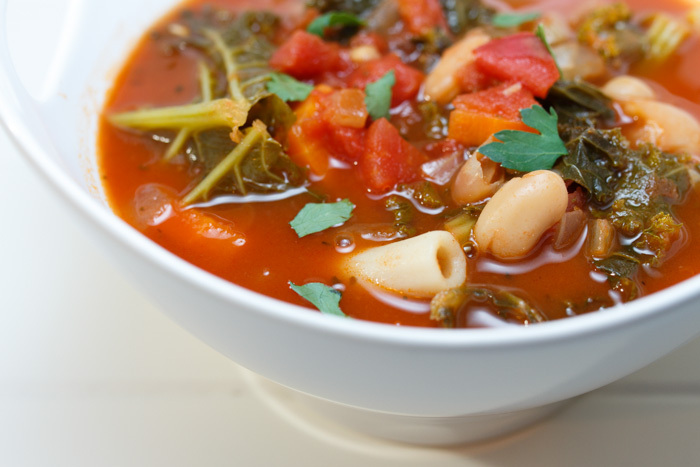 A perfectly well-balanced minestrone soup with a light tomato base full of perfectly seasoned and softened vegetables, beans and pasta. I kept mine pretty traditional, other than the addition of kale, but you could customize this in any way that suits you. The next time I make it I might include some zucchini for extra greenery. And some mushrooms because I have a mushroom addiction. But that’s just me. Heat the olive oil over medium-high heat in a large pot. Add the onion and cook for about 5 minutes, or until translucent. Add the garlic and cook until fragrant, about 30 seconds. Add the celery and carrot and cook for about 5 minutes, or until they begin to soften. Add the dried oregano, parsley flakes, and paprika, then season with salt and pepper. Add the kale or spinach and cook until wilted, about 5 minutes. Add the vegetable broth, crushed tomatoes and diced tomatoes then bring to a boil. 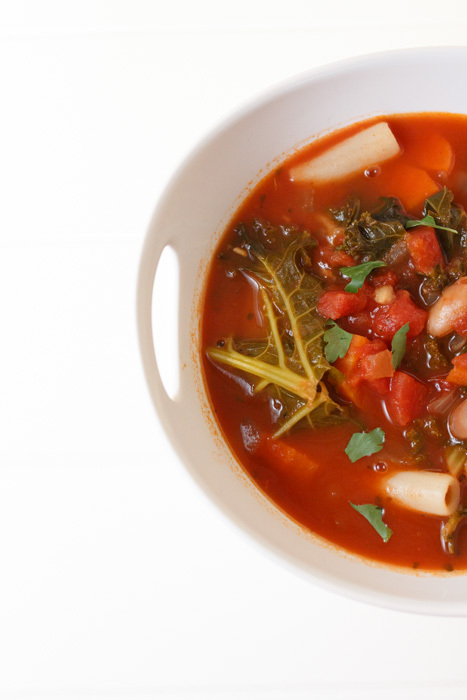 Reduce the heat to medium-low and add the pasta and beans. Cook for 10 more minutes, or until the pasta and vegetables are tender. Season with salt and pepper. Serve hot topped with fresh grated Parmesan cheese and chopped parsley. Recipe slightly adapted from the Food Network. I have loved ice cream as long as I can remember. Whether it was a simple scoop of vanilla at home, a soft-serve cone from the local lunch spot or a bowl of freeze-dried ice cream bits from the Dippin’ Dots fad, I have loved it, craved it and eaten it all. My love for creating ice cream, however, is a much more recent hobby. Years ago my stepmom purchased an ice cream maker for the family for Christmas. We made one batch of super rich chocolate ice cream Christmas morning and then that was the end of it. So this past summer I pulled it out of my parents’ basement, brought it to my apartment, dusted it off and got to work. 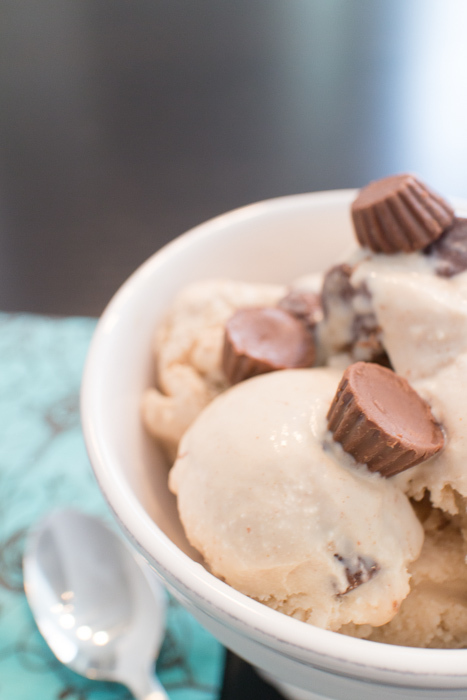 If you have been intimidated at the prospect of making homemade ice cream then this peanut butter cup ice cream recipe is a fantastic starting point. It is easy, simple, only requires a few ingredients and the end result is snarfworthy. The peanut butter flavor is strong and bold with the mini peanut butter cups providing a surprise treat in every spoonful. A smooth and creamy texture will leave you wanting just one more bite, especially since the ice cream isn’t overly rich. You will wonder why you’ve waiting so long to make something tasty and the ice cream maker will become a regular fixture on your countertop. 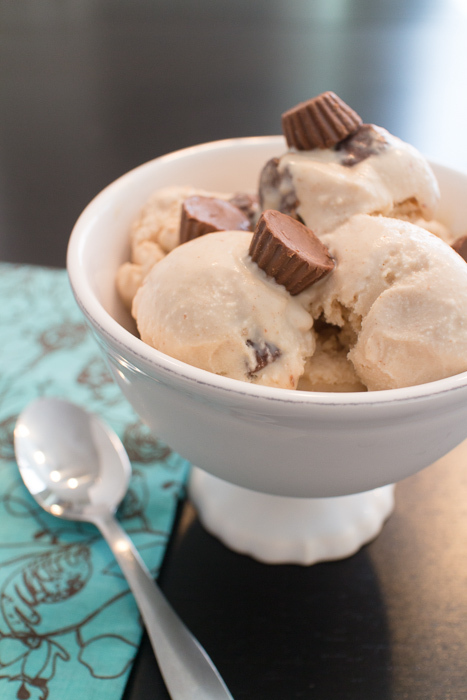 So make this peanut butter cup ice cream and treat yourself to a big scoop… followed by just one more bite. Using a blender or food processor puree the half and half, sugar, peanut butter, vanilla and salt until smooth. Chill the mixture in the fridge until cold then freeze in an ice cream maker according to manufacturer's instructions. 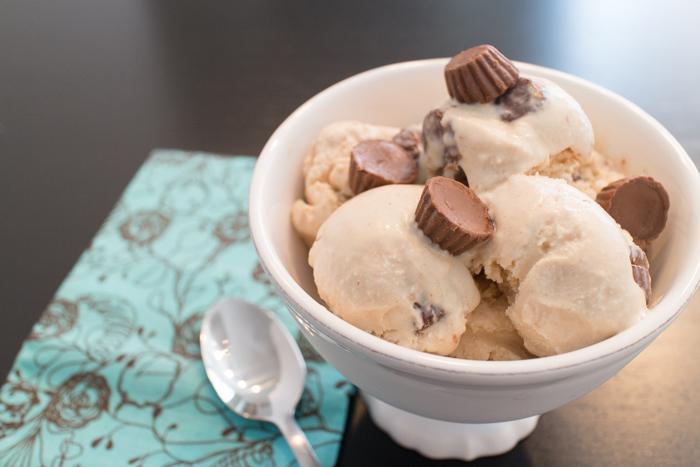 During the last couple minutes of churning add the peanut butter cups. Store in the freezer until firm enough to scoop. 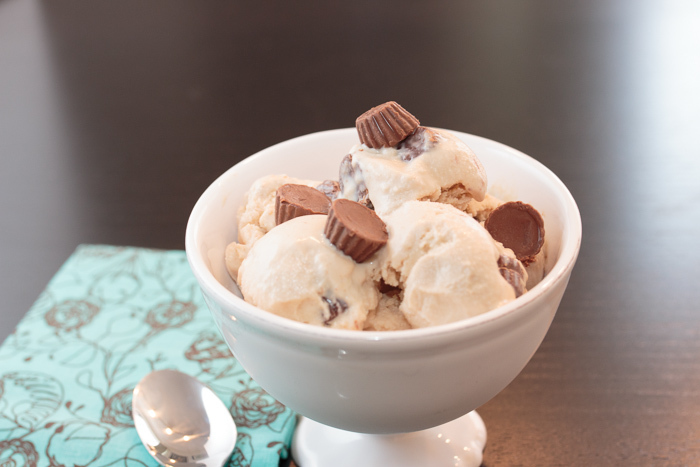 Recipe from The Perfect Scoop. Shiver me shamrocks, it’s almost St. Patrick’s Day! A day devoted to drinks, green beer, cupcakes spiked with Bailey’s and Irish accents? Now that’s something I can get behind. Let’s not forget that the ever classic “Luck of the Irish” will probably be playing on the Disney channel. I wanted to make something that would be perfect for St. Patrick’s Day, but was not too keen on cooking corned beef and cabbage. 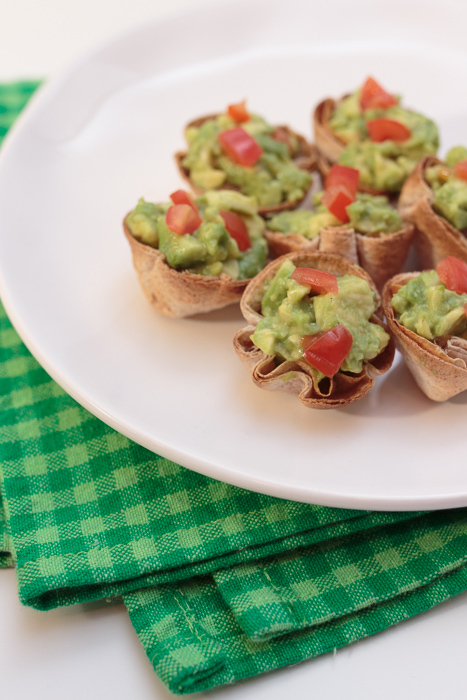 I decided to go with a green theme and came up with these cute, and delicious, guacamole tortilla cups. It’s the ultimate chip and dip with no dipping required. 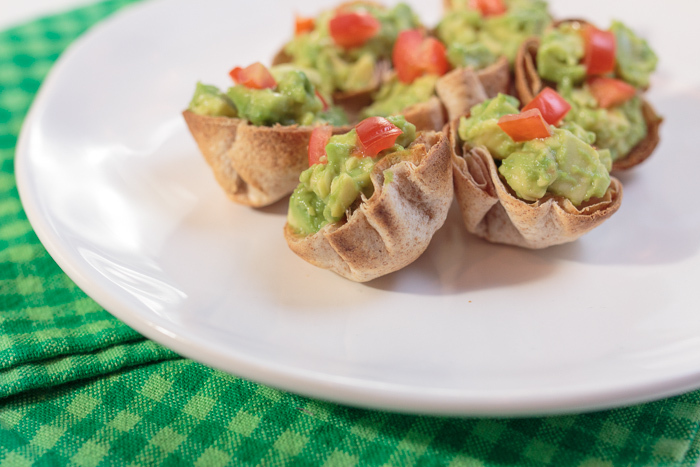 The green color makes them a great snack for March 17th, but this little appetizer would be ideal for gameday munchies or summer cookouts. These little cups could not be easier. 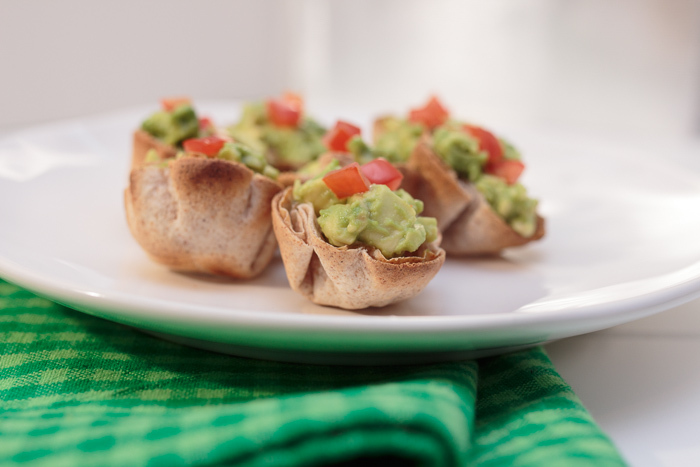 Simply cut rounds out of tortillas using a biscuit or round cookie cutter then press into the cups of a mini muffin pan. Bake until golden and voila! Edible cups at your service. 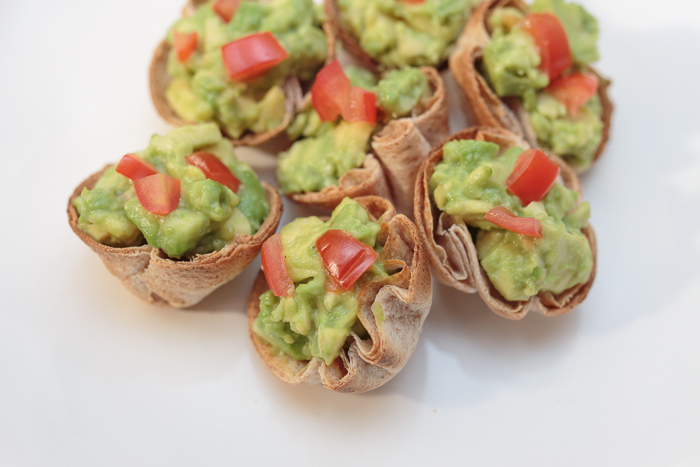 I can’t wait to test out more variations including filling them with salsa, seven layer dip, chicken salad, the list goes on! But for now I will happily chow down on this green guacamole version. Use a 2-3" round cookie or biscuit cutter to cut rounds from the tortillas. Press a tortilla round into a cup of a mini muffin pan. Repeat for the rest of the tortilla rounds. Bake for 8-10 minutes or until the tortilla cups are lightly browned. Remove from the oven and let cool on a cooling rack. Meanwhile, make the guacamole. Scoop the avocado out into a medium mixing bowl. Add the onion, lime juice, lemon juice, salt, garlic powder and chili powder. Using a sharp knife, cut through the avocado in the bowl until it is a small dice. When the tortilla cups are cool, spoon a heaping teaspoon into each cup. Top with the diced tomatoes. You will need 24 rounds of tortilla so you may need more of less tortillas depending on the size of your tortillas and the size of your cookie cutter. There are a lot of special days throughout the year, but yesterday was extra exciting. No, it wasn’t Ben & Jerry’s free cone day or a work holiday. And there weren’t any overturned bakery trucks spilling pastries into the street or any celebrity sightings. There was a birthday in the Lemon & Mocha family: yesterday Matt was one year older! What an old geezer! Just kidding, especially since I’m six months his senior. As I’m sure you’ve noticed, Matt is an amazing photographer and an excellent eater. He is also one of the most caring people and without his support and encouragement Lemon & Mocha might still have been a dream of mine rather than a reality. To celebrate Matt’s day of birth I wanted to make him an extra special cake. This was more difficult than it sounds as Matt and I have been heavily cutting back on desserts. 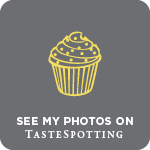 I found this fabulous blog called Sweetapolita that would ensure the treat would remain a treat and not a week-long gorge session of a full 9-inch layer cake. I haven’t had great luck with scaled down baked goods, including some incredibly disappointing recipe that made two dense vanilla cupcakes, but this mini cake turned out fabulous. Preheat the oven to 350 degrees F. Grease 2 round 5-inch baking pans. Line with parchment paper, butter and flour the parchment paper then set aside. In a small bowl whisk together 2 tablespoons of the milk, egg whites, whole egg and vanilla. Set aside. In the bowl of a stand mixer combine the cake flour, sugar, baking powder and salt. Add the butter and shortening then mix until combined. Add the rest of the milk then mix on low speed until just combined. Scrape the sides if needed. Slowly add the egg mixture to the flour mixture while beating on medium speed. Once just combined, evenly divide the batter into the 2 baking pans. Bake 20 minutes or until a toothpick inserted in the center comes out clean. Remove from the oven and let cool on a cooling rack for 10 minutes. Run a butter knife or offset spatula around the edges of the pans and invert the onto the cooling racks, making sure to turn them right side up for cooling. Let cool completely before beginning assembly. Heat 1½ cups of the blackberries, sugar, lemon juice, orange juice and salt in a small saucepan over medium heat. Cook, stirring often, until the berries start to cook down, about 10 minutes. Turn the heat to low and simmer for about 15 minutes, or until the compote has thickened enough that it coats a spoon without dripping off. When ready, remove from the heat and let cool for a couple minutes. Puree the mixture in a blender or food processor until smooth. Set a fine mesh sieve of a medium bowl and push the compote through, discarding the seeds caught in the sieve. Stir the remaining whole blackberries into the compote then store in an airtight container in the fridge. Place the cold water in a small bowl then sprinkle with the gelatin, letting sit for at least 10 minutes. Heat ⅓ cup of the cream in a small saucepan until just steaming then pour into the gelatin mixture. Place the small bowl in the fridge so the mixture can cool, about 8 minutes. Open the fridge and stir the mixture every couple minutes. Beat the remaining cream, powdered sugar, vanilla and salt with a stand mixer. This works best if the whisk attachment and stainless steel bowl have been chilled in the freezer. Continue to beat it soft peaks just begin to form, about 1 minute. Slowly add the cooled gelatin mixture, making sure to continue beating until it is thick enough to spread. Make sure you add the gelatin mixture very gradually of the filling could collapse. Place the mascarpone cheese in a large bowl then carefully fold in the whipped cream mixture. Cover the filling and place in the fridge until you are ready to assemble the cake. Carefully cut each cake in half horizontally so you have 4 equal cake layers. 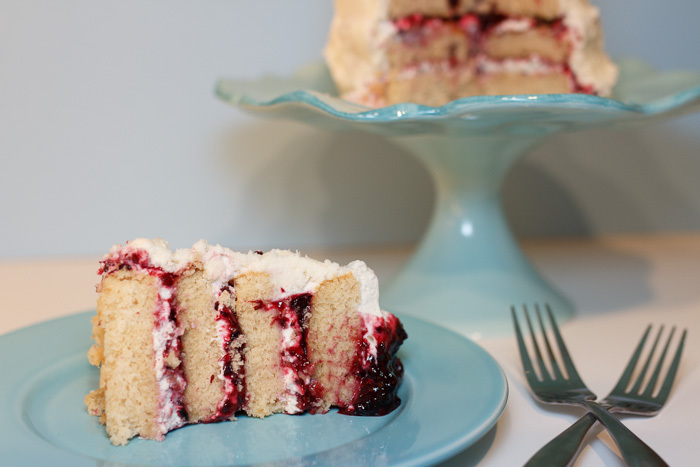 Place the first cake layer on a small plate or cake stand. 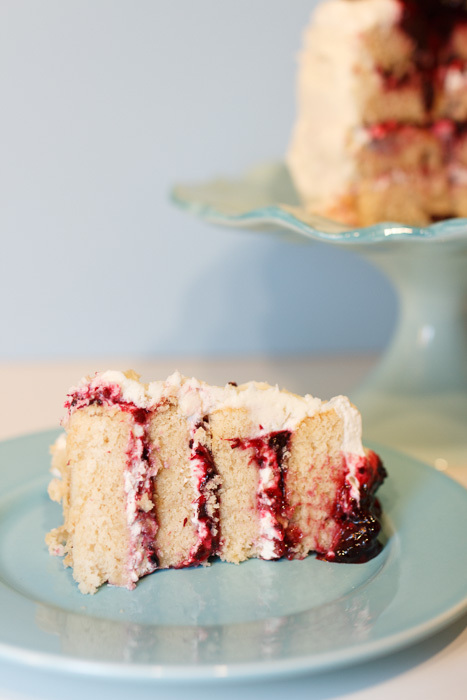 Place a few tablespoons of blackberry compote and a few tablespoons of mascarpone filling onto the center of the cake layer then carefully spread with a spatula. Place a second cake layer on top and repeat until the final cake layer has been placed on the cake. The final cake layer should be placed face down. Smooth the frosting in between the cake layers with an offset spatula and add more frosting on any spots where the compote filling is leaking out. 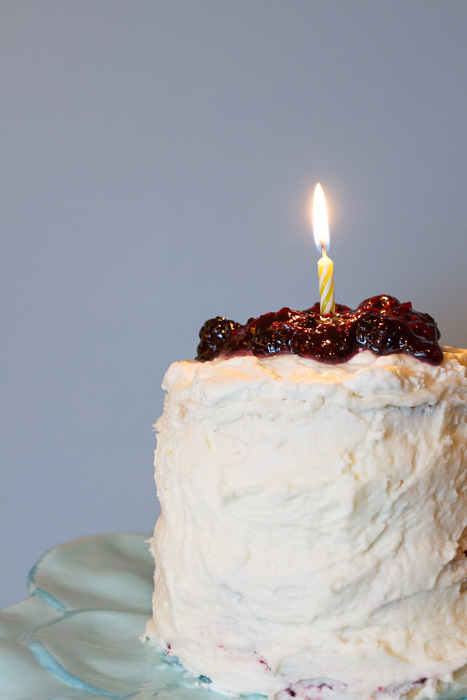 Carefully wrap the entire cake in plastic wrap and place in the fridge for 30 minutes to help it firm up before frosting. Making sure your frosting is fluffy, apply a thick layer allover the chilled cake. Smooth with an offset spatula.